I’ve lived in congested cities for as long as I’ve been alive, but for just as long, I’ve been fascinated by the natural world. Since I didn’t grow up around gardens or farms, I don’t feel that confident in my ability to grow things. And since I’ve never had a big yard to call my own, I’ve never had much space to try, either. 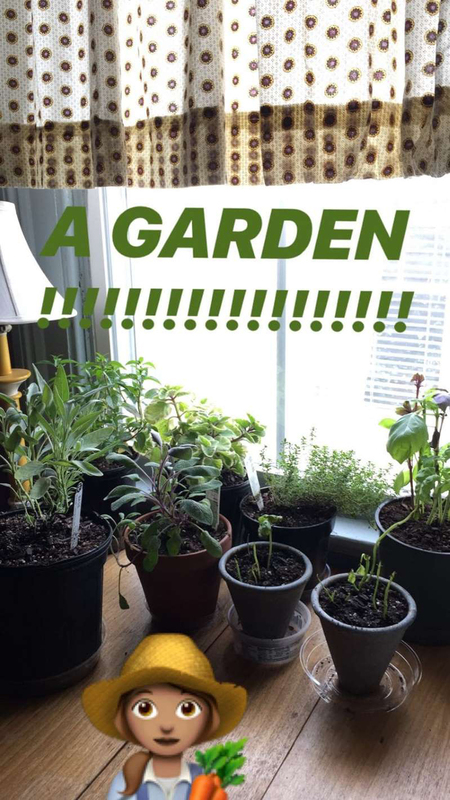 Thankfully, I had an epiphany recently: start an indoor garden! There are about ten thousand reasons to grow plants indoors. Plants keep the air cleaner. They improve your mental health. They provide food, flavor, and beauty. And in a basic sense, gardening is just satisfying. Like pets, plants can grow to feel like your little babies. Being short on outdoor space, or even indoor space, mustn’t prevent you from growing plants successfully. Contrary to what many people think, you don’t even necessarily need a sunny window to offer. Regardless of your living situation, there are plants that can thrive in your home. A confession: This isn’t the first time that I’ve had this epiphany. But it is the first time that I’ve really committed to making it happen. Until last year, I lived in a teeny-tiny studio apartment in a building that faced north, surrounded by taller buildings on all sides. In other words, there was no direct sun whatsoever. To make matters worse, the only accessible windowsill was directly above a radiator that got burning hot every winter. I wanted an indoor garden, sure. But I watched plant after plant crumple up and die. Watching plants die is not the best feeling. But, as I learned later, dead plants are a natural part of the learning and growing process. Sometimes plants die for reasons that are out of your control. Sometimes it’s all your fault. That’s just life – you learn from it and move on. 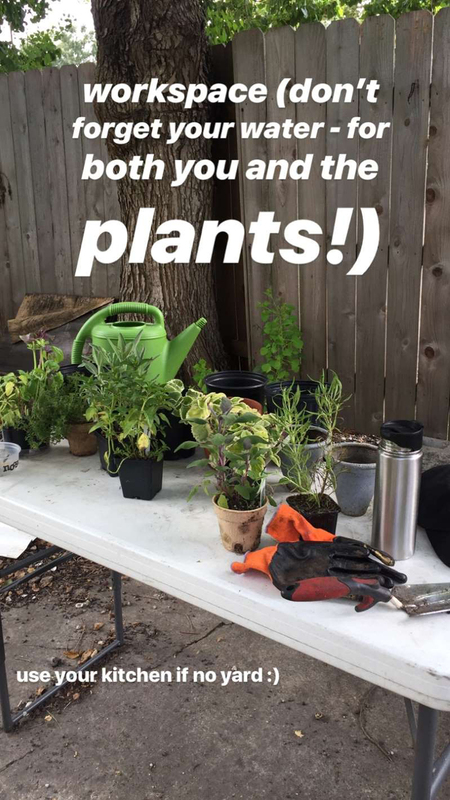 I love plants so much that, last year, I left my teeny-tiny studio apartment and moved south to New Orleans, where I apprenticed on a farm for six months. It was lovely. I learned so much. But going to work on a farm is different from having your own green space at home, one that’s just yours to care for and enjoy. Starting your own garden is scarier, yes, but I also thought it’d be much more satisfying. I don’t have much space. I don’t have buckets of money. 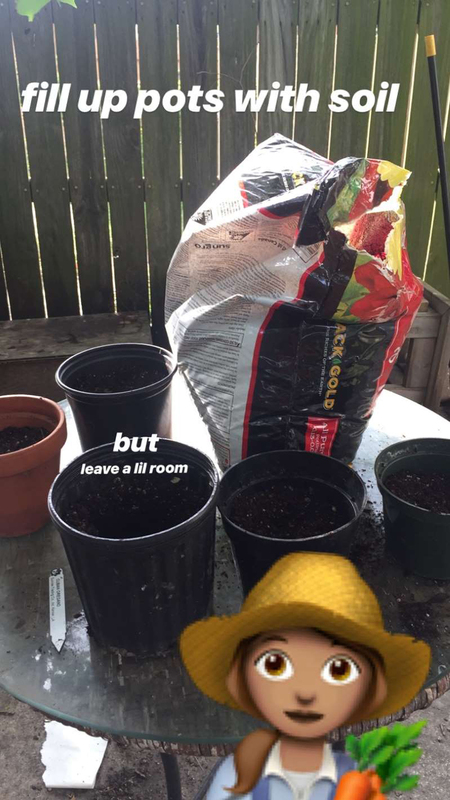 But I wanted to make my indoor garden finally happen, and this time I was determined to make it work. Here’s how I did it. 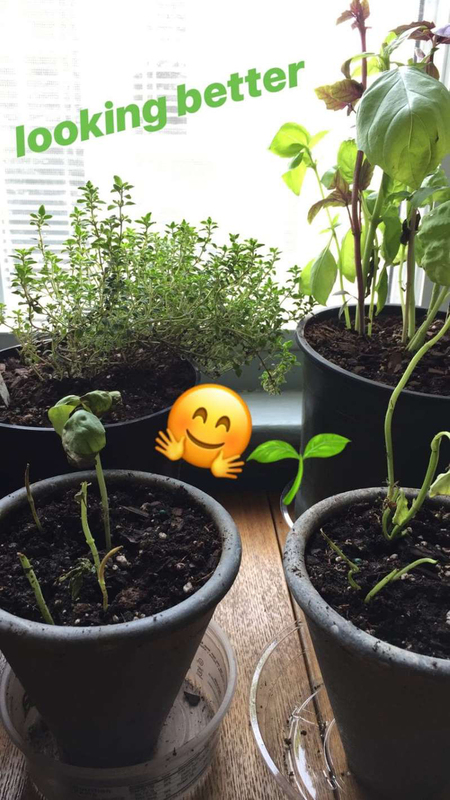 As soon as I decided to try this project, I knew which plants I wanted to grow: herbs. Culinary herbs like mint and basil are among the most popular indoor plants because they’re easy to grow in containers, they’re useful, and they don’t take up much room. 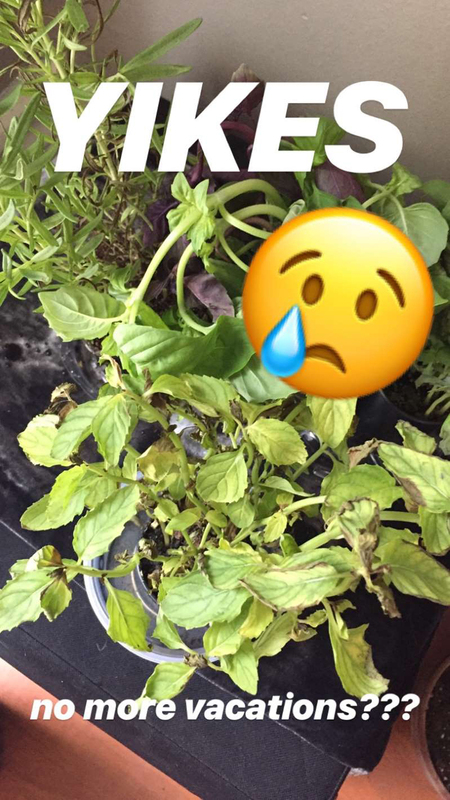 I’d tried to grow a couple herbs in my teeny tiny studio apartment and failed miserably. 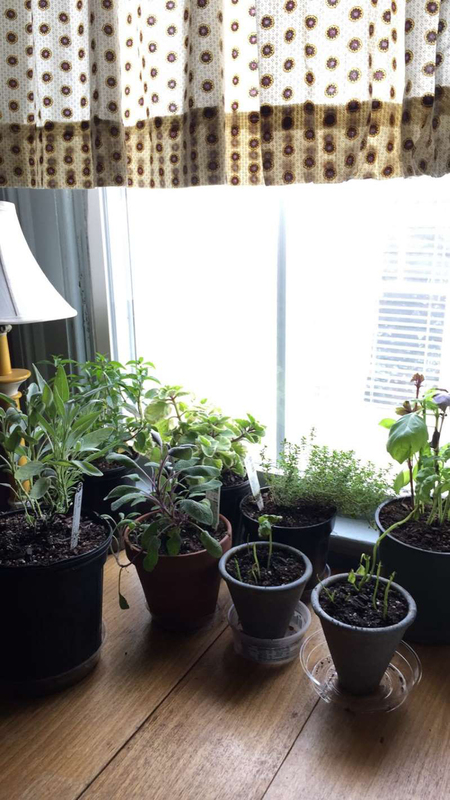 In my current home, though, I have a reasonably sunny window – something that most herbs need to thrive. So! Herbs it is. I ended up with 9 plants altogether. I recommend growing at least 5 plants to start with, because it looks impressive and because, let’s be honest, some of them might die at some point. I had two types of mint, two types of basil, two types of sage, Cuban oregano, lemon thyme, and rosemary. 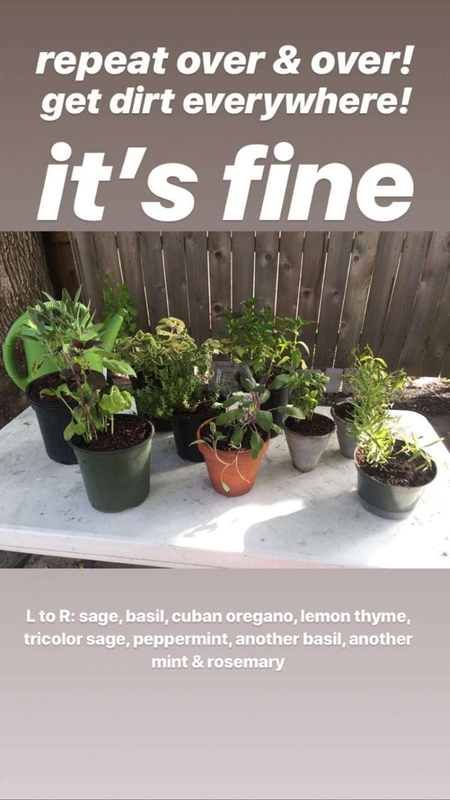 I chose these plants based on how pretty they were, how often I like to use those herbs, and how easy I thought they’d be to grow. 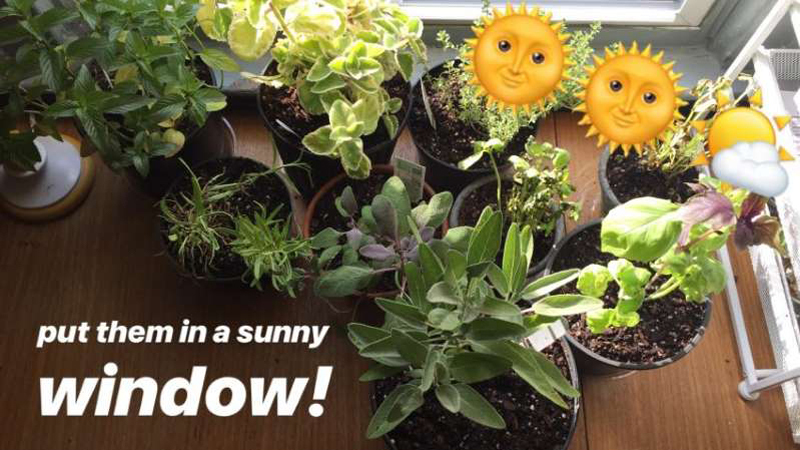 If you, too, get plenty of sun in your house but aren’t so interested in herbs, consider growing a succulent garden or an indoor veggie garden (hello lettuce and carrots!). You can even grow fruit indoors, believe it or not. If your house doesn’t get much sunlight, I’d recommend going with houseplants that do well in shade, like peace lilies, ferns, or pothos. Even some herbs, like mint, will grow in darker rooms. Also, keep in mind that you can grow pretty much anything no matter what your sunlight situation is – if you invest in a grow lamp. I bought my herbs from two places: the grocery store and the garden center. There was a noticeable difference in quality between the two, which became VERY obvious later. They also varied a lot in price. 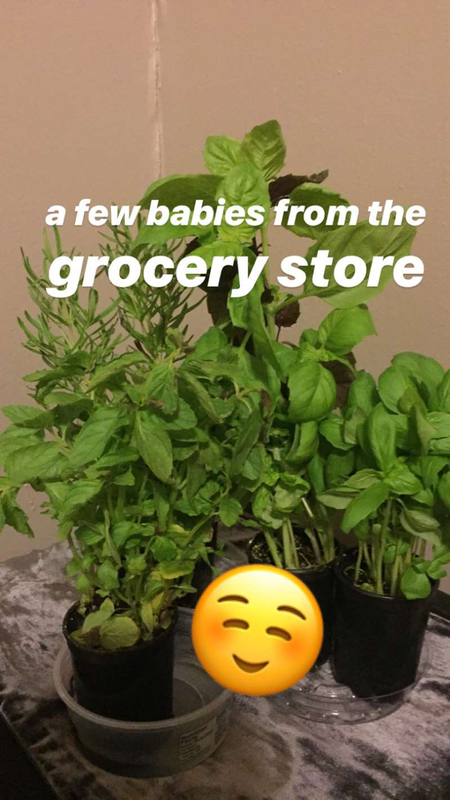 Grocery store herbs are a more convenient option – you can pick some up while you’re shopping for avocados, like I did! But at $4 to $5, they were almost twice as expensive as the garden center herbs. And somehow, they were worse quality, not better. 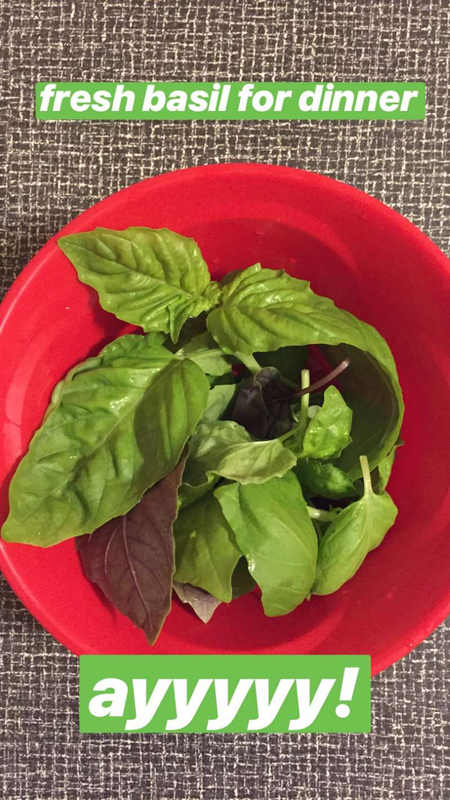 I bought four herbs from the grocery store – rosemary, mint, and two basil plants. Half of them nearly perished. They were overcrowded in the pots, and some leaves were a little brown already. I bought them anyway for the sake of experiment. And then I went on vacation overnight, and by the time I got back, they looked… really sad. 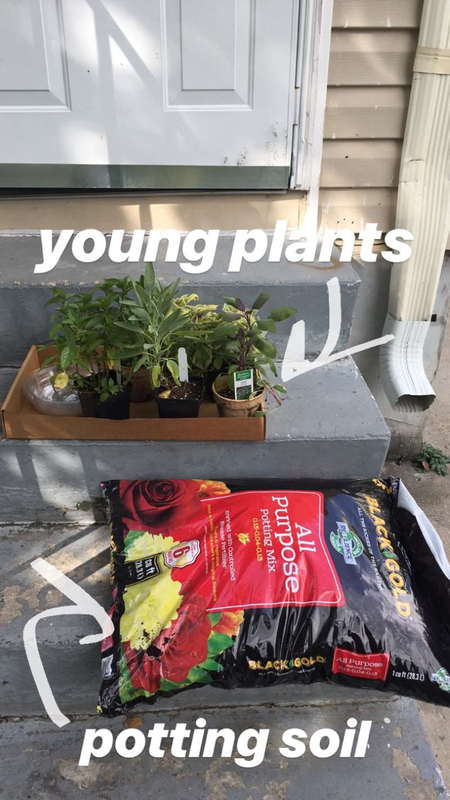 By contrast, the garden center herbs were dirt cheap – $2.25 per plant. They looked robust and well taken care of, which always makes things easier. From the garden center, I also purchased a standard, all-purpose potting soil mix for $9. In addition to plants and soil, I needed some pots. I did not want to pay for any. Luckily, I live with and around several green thumbs, so there were plenty of pots lying around. You can also re-purpose old plastic containers of your own, like yogurt containers. Just wash any containers with soap and water before using. And lastly, I needed trays for drainage. 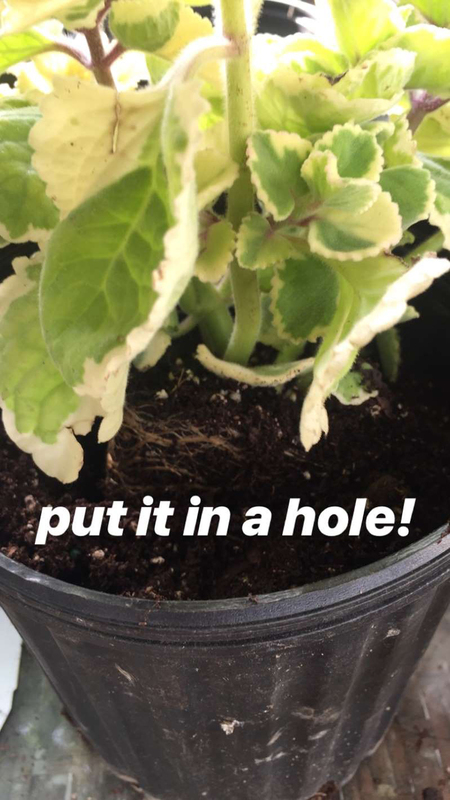 Plant containers need to have drainage holes, which means you need somewhere to collect the water. They sell little plastic trays of varying sizes at my local garden center for a few cents each. For soil, plants, and plastic trays, my total tally was $36. Alright! Now that you have your plant babies, you’re going to want to transplant them into their new homes. If you don’t have a backyard to do this messy work in, just use your kitchen. That’s what the broom is for. On my work surface, I gathered my plants, containers, soil, garden gloves, a trowel, and water. If you don’t have gloves or a trowel, do not fret! I have done this work with my bare hands more often than not. That’s what soap is for. The first step is to fill your containers with soil. This is your babies’ future home. Shed a tear because they’re growing up so fast. As you’re adding soil, pat it down gently so that the soil isn’t loose in the pot. Then, add more until the container is kind of full, but kind of not (can you tell I’m a total expert?). There should be a little room at the top because you’re going to dig a hole into the soil too. OK, now we dig the hole. 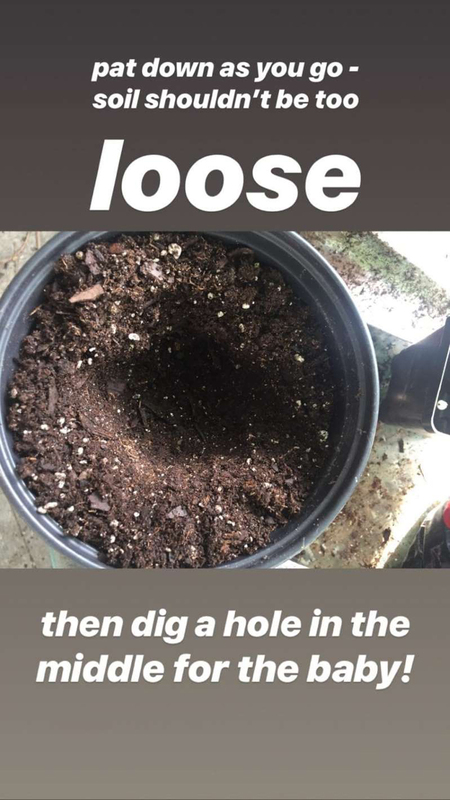 It obviously needs to be deep enough for the entire plant to go into. You want the plant to be deep enough in the pot to have plenty of room. However, it shouldn’t be so deep that the leaves have trouble reaching the light. I’m sure there are other rules to follow here regarding inches and height but I don’t know them, so who cares!!! Just dig a hole. Alright. Now we retrieve our plant babies. To remove the plant from the pot, I first turn the pot upside down so that gravity is working on my side. Then I gently squeeze the container to loosen the dirt on the sides. 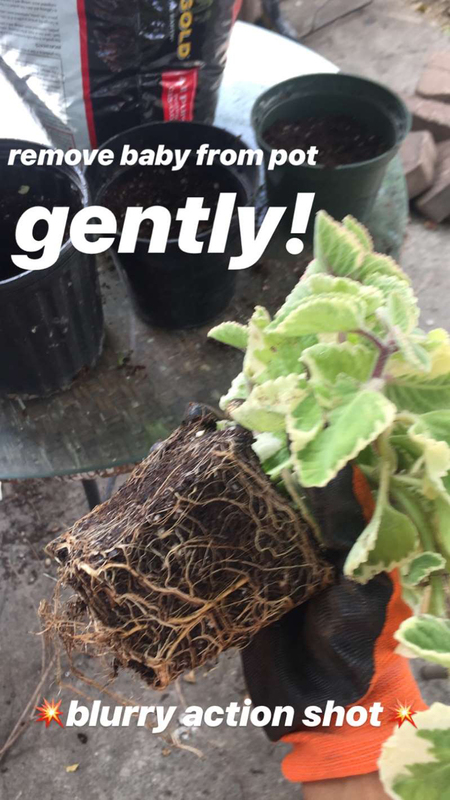 Then I gently tug on the base of the plant, while gently pushing upward from the roots, until it comes out the pot. The entire root system should come out together. Okay, now place that vulnerable plant into the hole that you created. You can adjust the size or depth of the hole if you need to. Then fill in the rest of the hole with soil. Pat it down again so that the plant is secure. Make sure all the roots are covered, but not any of the leaves. Now do that over and over until all your plants are transplanted. Dirt everywhere! You’re a gardener! Hooray! When all of the plants are safely in their new homes, water them. Next, I took my herbs indoors to the sunniest window that I could find. Those damn grocery store herbs were still STRUGGLING. 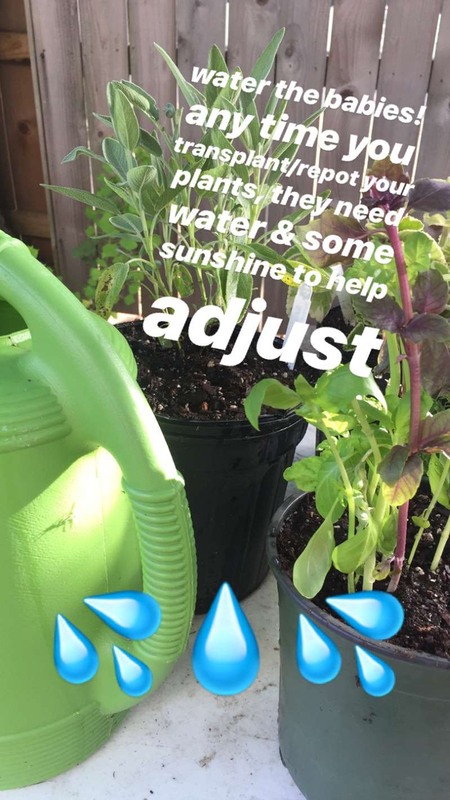 Sometimes you have to make a few adjustments, whether that be with the pots, sunlight, or water. In other words, sometimes it’s time to hit up someone else who knows better. I enlisted my girlfriend, who used to be an actual farmer. 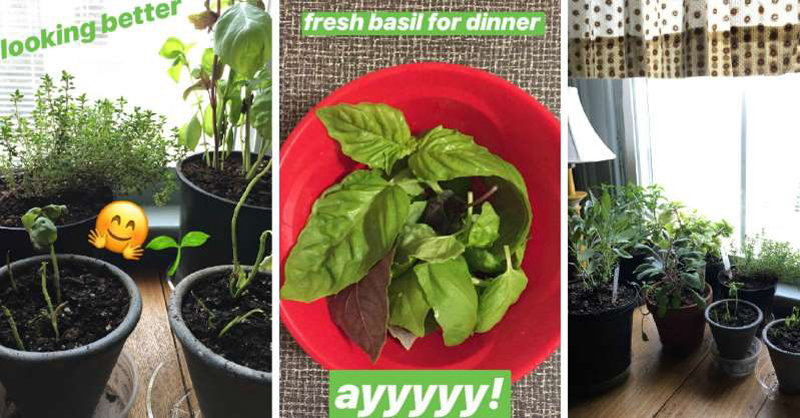 She bravely removed the struggling herbs – a basil plant and a mint plant – from their pots, then split each plant to get rid of the doomed parts and give the promising parts more room to thrive. I watched in admiration and did not ask questions. When she was done, the struggling herbs looked like they might make it after all. I’m still waiting to see if any new, healthy leaves grow. Even if they perish, though, it’s okay. Plants die sometimes. It’s part of the process. When they die, you add them to the compost pile (metaphorically or literally) and thank them for their service and move on. 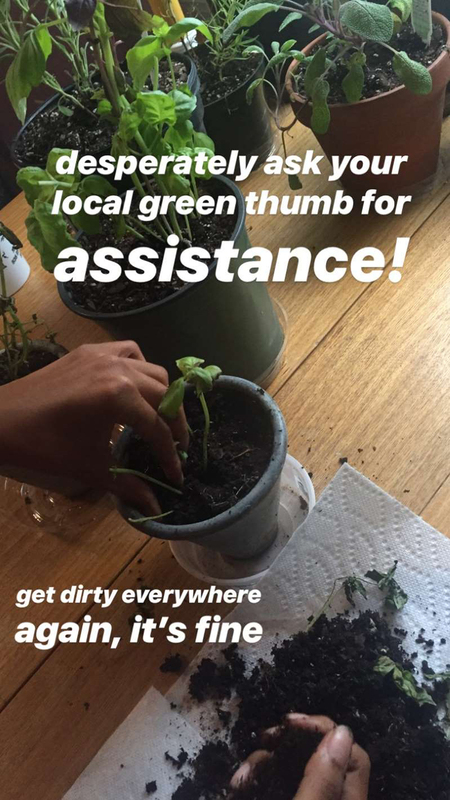 It doesn’t mean you’re a “black thumb” or that your house is doomed. Everyone’s plants die sometimes. I have 7 other healthy herbs to work with, and frankly, they look gorgeous! I’m a proud mom. So. 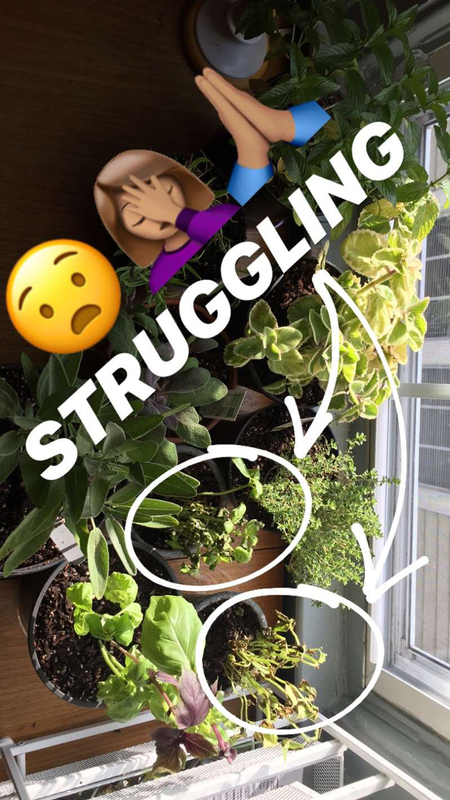 Now that I HAVE AN INDOOR GARDEN (OMG), how do I care for it? I water the plants when the soil is dry to the touch. I make sure the roots are not sitting in standing water. I trim dead leaves when I see them. 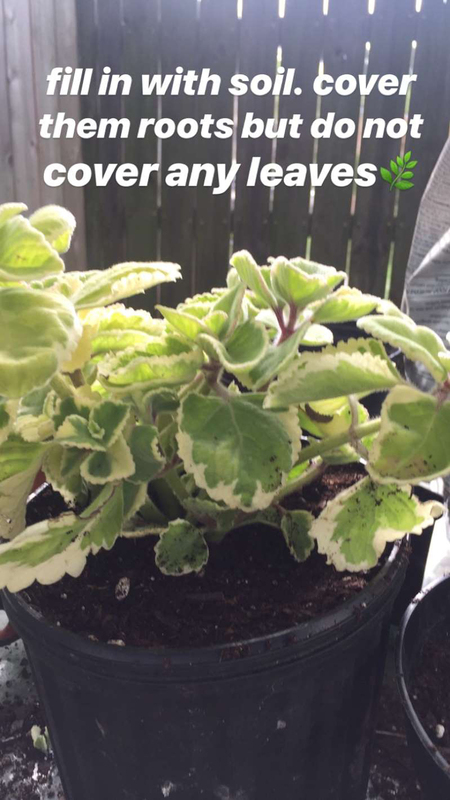 I harvest some healthy leaves to use sometimes – herbs do best when they are harvested regularly, but not over-harvested. A few leaves from each plant will do. If my plants outgrow their containers, I’ll transplant them into larger pots. That’s pretty much it. The plants, magical as they are, do the rest of the work themselves. They fill my window with yummy smells and beautiful sprawling leaves. They provide nourishment and healing. As I care for my indoor garden each day, I feel a sense of peace and responsibility. The plants force me to stop rushing around panicking all day and just pause and tend to them and breathe. Thanks to them, I feel more connected to the earth again – and to myself.